The 401(k) retirement plan used to be a fairly standard benefit offered to employees at mid- to large-sized companies throughout the 1980s,’90s, and early 2000s. The plans served not only as a savings vehicle for retirement but also—thanks to matching employer contributions—as a means of attracting new talent and as an incentive for existing employees to remain with the company. But the glory days of the 401(k) appear to be coming to an end. In October 2015, Bloomberg reported that almost half of all US workers do not have access to a company-sponsored retirement plan and that only 45% of businesses with fewer than 100 employees offer 401(k) plans. Those numbers are expected to continue trending downward. Self-directed IRA — may be set up as a traditional IRA or Roth IRA for many of the same benefits; allows you to invest in precious metals (gold, silver, platinum, and palladium) as well as real estate, LLCs, mortgages, franchises, etc. Of these options, self-directed IRAs give you the greatest amount of control and flexibility with your money. Not only do they offer tax-free growth, but they also allow you to protect your portfolio with gold, which is the best hedge against inflation, a sputtering domestic economy, and global economic ills that might arise in the future. 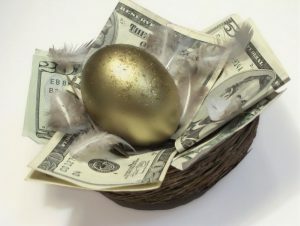 401(k) plans from former jobs are also eligible for a tax-free rollover to a Gold IRA. Although 401(k) plans are not quite a thing of the past, they sure are headed that way. So don’t look to your employer for a secure future; instead, take retirement saving and investing into your own hands by opening a self-directed Gold IRA through American Bullion today.